WRAPmail (http://www.WRAPmail.com) (OTC: WRAP) a provider of free and enterprise email branding solutions, today announced that they have launched their Affiliate Network solution where users can earn money with every email they send and every new client they get for WRAPmail. Users can have a free WRAPmail account, sign up for a free affiliate account and make money on every email they send as all free accounts have 3rd party advertising. WRAPmail also has an API for affiliates so they easily can have their contacts sign up for WRAPmail. 1	WRAPmail PRO: Our free shared solution that will have advertising from other WRAPmail clients incorporated. Not only is the solution free and the ads will not interfere with the WRAP (unless the user wants it to) but WRAPmail will share the Advertising revenue with the user provided they sign up for WRAPmail’s affiliate program. 2	WRAPmail PRO+: Shared solution, $50/user/year. No 3rd party ads unless the client signs up for the affiliate program and also allows ads to be displayed. These users will be able to select the advertisers/ads they want displayed in or around their WRAPS if they elect to allow ads. 3	WRAPmail Enterprise: Dedicated solution, $3,500/year plus $40/year per user. WRAPmail will host a dedicated Server for each Enterprise client and this solution has all the features of the shared solution plus a Campaign Module for sending email campaigns. There is no extra charge for using the campaign module and we believe there is a brand new market opportunity for WRAPmail with this solution with the heavy users of Newsletters and mass mailings. The major differentiator between WRAPmail and companies offering mass email solutions is the fact that WRAPmail emails get delivered without the Red X and message to download images in email clients. WRAPs also do not look like posters but rather like regular emails framed in images with embedded links. Premade templates are currently available for major Network Marketing/Affiliate Marketing/MLM companies, Real Estate Agents, Business, Scenery, Sports, Holidays and Animals with Social Network Interface and personalization (image, text and links). Currently themes are available for Amway, NuSkin, Melaleuca, Usana, ACN, Isagenix, Forever Living, Xango, Herbalife, Arbonne, Advocare, Mannatech, Tahitian Noni, 5LINX, Nature’s Sunshine, Legal Shield, Nikken, Shaklee, Synergy, Neways, Juice Plus, GNLD, Sunrider, Avon, Natura, Oriflame, Market America, LR Health & Beauty, Monavie, Send Out Cards, Lifewave, Tupperware and IwowWe, Re/Max, Prudential, Century 21, Keller Williams, Coldwell Banker and ERA. New ones are added on demand. Ning, orkut, tagged, Twitter, Xanga, Pinterest, YouTube, Blogger, ecademy, flickr, viadeo, xing and plaxo. New ones are added on demand. Clients can also make 100% custom WRAPS in the WRAPmail dashboard. Google will let you add other email accounts you own under your Gmail account and then let you use Gmail to both send and receive these emails. WRAPmail can then WRAP them for free! 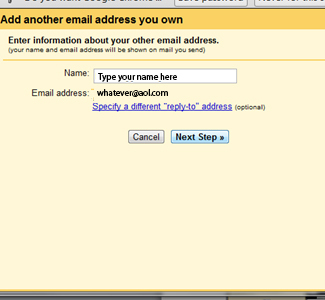 You need to set up a new email address on AOL for example (www.aol.com). Then you need to follow the steps as described below. 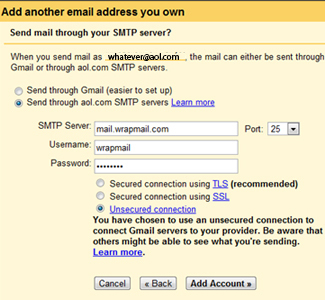 You will do everything in the Google interface but all your emails will now come from and to your new AOL email address even when people send emails to your Gmail address. 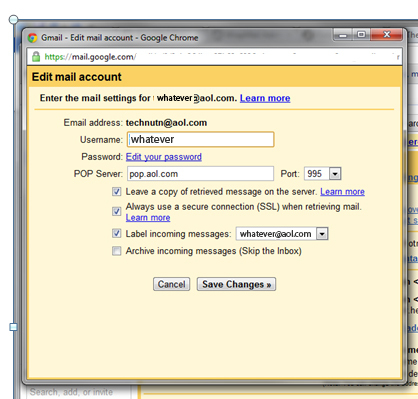 No email sent to your Gmail address will be lost! Yahoo is tricky as Yahoo is the only webmail provider we have found that charges for POP3 delivery of email. 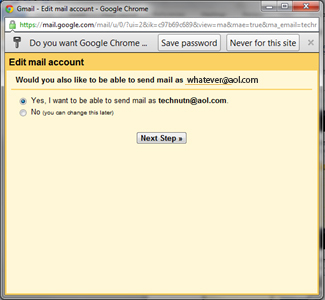 You have two choices, upgrade to Yahoo Plus or change email address to an AOL, Hotmail or other free email address and then also set up a Gmail address so that you can use WRAPmail and the Google dashboard. WRAPmail (OTC:WRAP), a provider of free and enterprise email marketing and branding solutions is happy to announce that we signed over 1,000 new clients since our last update bringing the total number of clients signed since January 2006 to over 4,500, an increase of 28%. US, Philippines, Norway, India, Pakistan, Columbia, Brazil, Cayman Islands, Singapore, Mauritius, Canada, Korea, Belgium, Poland, Italy, Denmark, UK, Finland, Australia, Sweden, Kenya, South Africa, Spain, Portugal, Holland, UAE, Senegal, France, Romania, Germany, New Zealand, China and Serbia. Real Estate, Attorney’s, IT, Hotel, Restaurant, Manufacturing, Furniture, Non-profit, Automotive, Marketing/Advertising, Publishing, Construction, Travel, Government, Telecom, Clothing, Beverage, Entertainment, Investment/Finance, Accounting, Medical, Supermarkets, Energy, Broadcasting, Network Marketing and various Consumer Goods Suppliers. WRAPmail is currently in the growth stage of the company focusing on growing the number of users. The next stage for the company will be implementation of an ad-revenue model where users will have an option to opt in and share the revenue from 3rd party advertising. With billions of one-on-one emails (not bulk/mass emails) sent every day we believe the ad revenue model has the best potential for our company, users and shareholders alike. Email is a viral medium and users benefit from the WRAP (their advertising) spreading. WRAPmail (http://www.WRAPmail.com) (OTC: WRAP) a provider of free and enterprise email branding solutions, today announced that they have made available the first component of their webmail solution built in to the WRAPmail dashboard. The idea behind WRAPmail is to utilize the facts that all businesses and most individuals have websites and/or belong to one or more social networks. Furthermore we all send emails every day. With WRAPmail these emails can for businesses become branding tools and for individuals they can all have one or more personal interactive stationaries surrounding the text. Personal WRAPS can for example have images/links to Social Networks such as Facebook, Twitter, YouTube and LinkedIn (Nasdaq: LNKD). A WRAP consists of images and embedded links and 100% customizable by the users so whether one wants to promote ones business offerings or simply create a party invitation it is all possible in the WRAPmaker which is part of the WRAPmail Dashboard. Windows Live Hotmail (Nasdaq: MSFT), Yahoo (Nasdaq: YHOO), Gmail (Nasdaq: GOOG) and AOL (NYSE: AOL) have almost 1 billion email users among them. All of these users plus users of any other webmail solution (such as GoDaddy for example) are now able to send WRAPPED emails from the WRAPmail dashboard uniquely available to anyone who signs up for WRAPmail’s free service. They only way to do this earlier would be for them to start using an email client but our research shows that changing from webmail to client-based was a huge obstacle and steep learning curve for most. In the first component released users can COMPOSE an email, send it and have it arrive to the recipient WRAPPED with a copy stored in a SENT folder. The next step which we aim to release shortly will be full webmail where users can not only send but also receive emails directly into their unique WRAPmail Dashboard. WRAPmail is compatible with any device with an internet connection and browser.